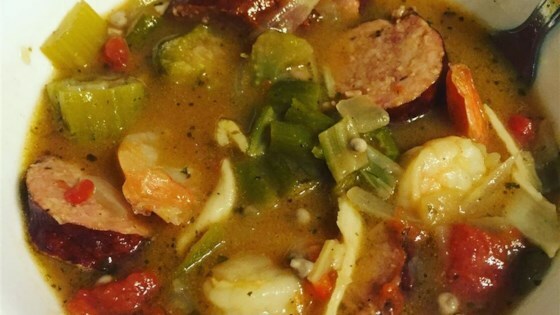 "This is a basic gumbo recipe with a lot of added flavor. You can omit the stew meat if you choose or add something in its place. I recommend you serve this recipe over rice, like many other gumbo recipes." Melt butter in a large skillet over medium heat. Cook garlic, onions, celery and okra, stirring constantly until golden brown. Set aside. In a large heavy bottomed stock pot over medium-high heat, combine 1/4 cup of butter and flour. Cook, stirring constantly, until the roux becomes chocolate brown. Stir in the vegetable mixture, and stew meat. Cook, stirring, until vegetables are tender, and meat is evenly brown. Stir in water, tomatoes and sugar. Season with parsley, thyme, bay leaves, salt, cayenne pepper and black pepper. Bring to a boil, reduce heat, and simmer for 2 1/2 hours, stirring occasionally. Add shrimp, crabmeat and andouille to stock pot. Stir in hot pepper sauce and Worcestershire sauce. Remove seeds from lemon and squeeze juice into stock pot. Simmer an additional 10 minutes, stirring occasionally. Remove bay leaves, sprinkle with filé powder, if using, and serve over rice. Watch Chef John make a classic New Orleans gumbo. Filé powder can be added off the heat to thicken the gumbo. If added while the gumbo is still cooking, it may become stringy and unpleasant. File powder is ground sassafras leaves. It is available in many supermarkets. It came out okay, but it did not have the "gumbo flavor" I've had out of New Orleans, so I added some Zataran's gumbo seasoning to give it a kick. Delicious! I did substitute scallops for the beef. Great recipe as written. My hot sauce was habanero. I added chicken gizzards instead of the stew beef. The gumbo was everything I expected it to be. It has become one on my favorite recipes. Wow! This was great. I used chicken instead of the shellfish and beef and it was wonderful. I would highly recommend it as a way to serve chicken. My whole family (3 kids under 8) enjoyed it.